Dickey’s Barbecue Pit franchise complaints include dishonest and illegal franchise sales tactics, illegal and inflated earnings claims, understated investment costs, improper franchise disclosure, and more. While these complaints are allegations and franchisee opinions, we suggest that prospective franchisees should pay particular attention to these areas while investigating the Dickey’s franchise opportunity. (UnhappyFranchisee.Com) Matt & Carla Chorley are no strangers to research. Prior to investing in a Dickey’s Barbecue Pit franchise, Matt was the Senior Director of Operations at a biotechnology company and Carla had been Director of Operations at a life sciences firm. Unfortunately, the Chorley’s learned the expensive lesson to not base their research on representations allegedly made by a Dickey’s Barbecue Pit franchise salesman. In a lawsuit filed May 21, 2014 in the United States District Court of Maryland (CHORLEY ENTERPRISES, INC., MATTHEW and CARLA CHORLEY v. DICKEY’S BARBECUE RESTAURANTS, INC., ROLAND DICKEY, JR., & JERREL DENTON), the Chorleys claim that Dickey’s Director of Development Jerrel Denton induced them with illegal and inflated earnings claims, with grossly understated start-up costs, and with the false promise that they could keep costs low by sourcing used equipment… which they were later prohibited from doing. By trusting the representations made by Dickey’s and Jerrel Denton, the Chorleys claim to have lost more than $300,000. 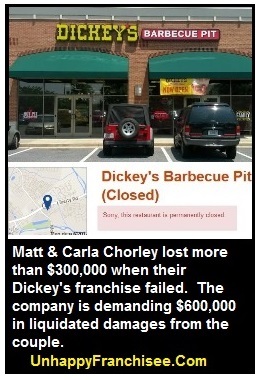 To add insult to injury, Dickey’s is seeking more than $600,000 in liquidated damages from the Chorleys. Are you familiar with the Dickey’s franchise opportunity? Please share your opinion – positive or negative – below. Franchisors are forbidden from making financial performance representations for new outlets unless those representations are documented in Item 19 of their Franchise Disclosure Document (FDD). c. based on the particular market in which Chorley was looking to operate, he should be able to do over $1,000,000 in annual revenues with one store. …Dickey’s, by and through its authorized agent Jerrel Denton, made numerous representations of, or from which could be ascertained, specific levels or ranges of actual or potential sales, income, or profit from Dickey’s franchised units, which earnings claims were not included in the 2011 FDD. This conduct was in violation of MD. CODE REGS. (COMAR) 02.02.08.16(D)(3) and, by operation of law, Section 14-229(a)(3) of the Act. …the statements made by Denton on October 4 and the information contained in Item 7 of the 2011 FDD materially misrepresented the initial investment amount required to open a Dickey’s franchise. Denton represented to Chorley that a prior food service facility could be converted to a Dickey’s restaurant for $30,000 or less, and that $89,000 was sufficient funds to open 3 such restaurants. The 2011 FDD stated that the total initial investment required to open a Dickey’s restaurant from a prior food service facility was between $63,556 and $162,438. Chorley’s actual initial investment was more than $300,000. The Trouard lawsuit, the Chorley lawsuit, and franchisee James Neighbors all contend that they were made certain promises by the sales staff that were contradicted by the operations staff AFTER the franchise agreement was signed. The projected equipment costs were 5 to 10 times greater than the $10,000 and $20,000 figure Denton represented to Chorley in October 2012, several multiples greater than the $13,701 figure listed in Item 7 for a “Non-Traditional Conversion”, and well more than double the $37,633 listed in Item 7 for a “Restaurant Conversion”. 44. On information and belief, Chorley alleges that Dickey’s intentionally withheld the equipment cost information from Chorley until after he had executed the lease because the lease obligation would make it less likely that Chorley would seek to terminate the Franchise Agreement once the huge discrepancy between the actual equipment costs and the costs stated in the 2011 FDD was revealed. The final cost of construction to convert the Frederick Property into a Dickey’s Barbecue Pit was more than triple the cost Chorley had been told by Denton, and several multiples higher than the amounts listed for “leasehold improvements” in Item 7 of the 2011 FDD for either the “Non-Traditional Conversion” or “Restaurant Conversion”. The monthly rental amount Dickey’s proposed in the LOI was approximately $7,800 per month, which was significantly higher than what had been listed in Item 7 of the 2011 FDD… Chorley felt pressured by Dickey’s real estate team to sign the LOI and move forward. On or about November 8, 2012, Ellis told Chorley that if he did not sign the LOI, the timeline for opening his restaurant would be delayed, resulting in a default under the Franchise Agreement. In or about April 8, 2013, prior to the opening of Chorley’s first restaurant, Denton contacted Chorley by phone and advised him that there was “tons of activity in [his] area” and that Dickey’s was about to sell a franchise to another operator near Chorley’s restaurant in Frederick, Maryland. … Denton told Chorley that the only way he could protect his store from direct competition from another local franchisee was to purchase the territory through a development agreement. …[Denton told Chorley] he could expect his second store to generate $1,000,000 in revenue with 10% profit. …Having already spent or committed to spend more than double his original investment budget, Chorley was particularly sensitive to the threat competition posed to that investment… As a result, Chorley executed a developer agreement [and]… paid Dickey’s a development fee of $15,000. Chorley, of course, never had the chance to open the second store and Dickey’s kept the $15,000. Franchisors are fond of saying that “we’re all in this together,” and that they only succeed when their franchisees succeed. However, some franchisors not only are unsympathetic when franchisees fail, they sue them for the royalties and marketing fees they would have paid had they been successful, liquidated damages, and/or other forms of failure fees. According to the Chorley lawsuit, even after the couple lost $300,000 and paid an additional $15,000 development fee, Dickey’s is seeking damages for more than $600,000. Dickey’s is seeking the same from franchisee Justin Trouard, and is demanding $675,122.55 from James Neighbors, who was forced to close after only 3 months. We’ve heard the same from many, many franchisees: When franchisees fail, they fail alone. When I spoke with Dickey’s they said they didn’t believe in making earnings claims in the FDD. I guess tha didn’t feel one was needed. I’ve owned my Dickey’s Barbecue Pit since 2008. It has been nothing but a positive experience! Throughout my relationship with Dickey’s they have always been very available for support, whether marketing, training, purchasing or development. Ultimately, I realized that the success of my restaurant was up to me. My engagement has been crucial to my success. Being 100% engaged in my business and it’s direct effect on my profitability has always been a clear expectation between myself and our corporate office. I look forward to a long and prosperous association with Dickey’s Barbecue Pits! In the interest of transparency, though, it would be helpful if franchisees who are also area developers disclose that fact. The Dickey’s FDD states that a Meg Heintzelman is an Area Developer for Dickey’s and sells Dickey’s franchises in PA.
Area Developers have a greater economic incentive to defend the franchise opportunity than regular franchisees, and (in our opinion) really should identify their relationship when providing endorsements… especially in a discussion about honest franchise disclosures. Area Developers are encouraged to share. As you also sell franchises, what is your reaction to the alleged representations? Are you instructed to NOT make earnings claims? Is the $600,000 based on the 20 year franchise agreement? Twenty years is a long time. You sell franchises and guess what you can’t say how much you make with your Dickey’s to any prospective franchisee in or outside your development area. Guessing you don’t know that because Dickey’s is run by the franchise gang that can’t shoot straight. Franchise sales compliance seems to be a weak point for the Dickey’s home team. Oh and Dickey’s in-house attorney just left them too. What’s up with that? I do not like Dickie’s barbeque. Simply put, they are greedy and chintzy. In Frisco, Texas, where we lived for 7 years, Spring creek barbecue, a direct competitor, allows you to get as many vegetables as you like, AND they allow multiple return trips for vegetables with their plate meals. You fill your own plate with vegetables also, instead where some of the Dickie’s locations do it for you. Dickie’s, on the other hand, charges extra for every vegetable, and allows no return visits for more. Their plates typically come with ONE vegetable and you get a hefty charge for a 2nd one. It is a stupid concept – if I get one vegetable, I will simply eat twice as much of that one vegetable – give me two and I need 1/2 as much of each. They also charge for a cup of water. Once I thought the server was being chintzy on the beans when it was well below the top of the cup – I mentioned it and he said it was the ‘correct amount’ and would not fill it up. Their meals are already overpriced in my opinion, so the chintzy treatment is insult to injury. I will not go to any of the Dickie’s chains any more thanks to their greediness. I had 4 slabs of ribs smoked @ Dicky’s Mac Arthur/Walnut Hill in Irving, tx. for a family event. I was charged $1.50 per lb. The ribs were dry and burnt when I picked them up the following day. I received a refund but was still left with @ 10 lbs of meat i could not eat.